This is a surprisingly detailed resource on sculpting 3D human figures. 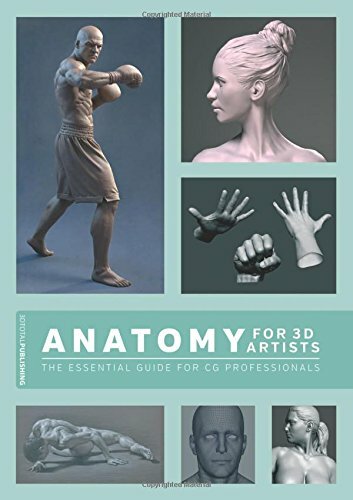 The book's for intermediate and advanced 3D artists. You'll definitely need to know your 3D software quite well because the book assumes you already know the basics of modelling and also posing. For example, when a figure is posed, the book talks about the muscles that are affected rather than instructions on how the figure was posed. There are three parts to the book. The first part focuses on drawing the human figure. This section talks about the skeletons, muscles and proportion, and ends with many pages of graphite figure drawings with commentary. Part two covers 3D sculpting. There are 4 lessons each for modelling the male and female figures. First one's on creating the basic form, followed by sculpting the muscle, touching up the skin (veins, pores, etc) and finally more detailed instructions on the head, arms and shoulders. Third part of the book has three detailed tutorials for creating models for a male bodybuilder, curvy woman and slim woman. The tutorials are actually more like step-by-step breakdown of how each artist goes about with the workflow from start to finish. The book provides insight rather than those click-this-and-that-software-specific instructions. The techniques taught can be applied regardless of the 3D software you're using, although the book uses mainly ZBrush with occasional 3ds Max and Maya tips. There's also a chapter dedicated to topology to help you create the best figure that can be used for animation. You'll learn things like edge flows, joints, polygon density, quads vs triangles, and many more tips to create a clean topology. Lastly, the book has a reference gallery of some sculpted figures with all the muscles clearly labeled. The male model that's included has front to side views so you can use that for reference when going through the tutorials. This is a very detailed anatomy resource written specifically for 3D artists. It's incredibly insightful but you will need to know your basic 3D sculpting skills well to get the most out of the book. Other relevant books I would recommend are Classic Human Anatomy: The Artist's Guide to Form, Function, and Movement and Anatomy for Sculptors: Understanding the Human Figure.